Both the clear frame and fabric frame are in stock and ready to ship. 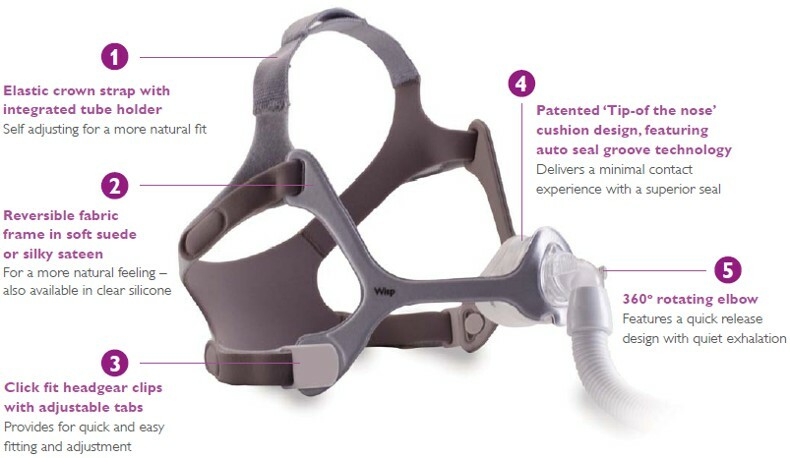 Philips Respironics is changing the face of sleep with the Wisp nasal mask. For the first time, you can have a mask that combines the performance and comfort of a leading nasal mask with the aesthetic elegance of a pillows mask. With its unprecedented minimally invasive design and superior seal, Wisp will finally deliver the comfort and performance you deserve. The Philips Respironics Wisp nasal mask is a minimally invasive nasal mask, much like a nasal pillows mask but without the need to insert nasal prongs into the nostrils. If you like the idea of minimal-contact masks like nasal pillows masks, but don't like the idea of inserting the nasal pillow cushions into your nostrils, then the Wisp may be just what you're looking for. The Wisp has a quiet vent which diffuses air nicely away from the wearer and a bed partner. The air leaves the elbow at approximately a 45-degree angle upwards as you are looking at the mask from the side. This means that if you're facing a bed partner, the bed partner is unlikely to feel any air. It also means that air won't be blowing down the tube onto your chest or arms. With very few parts, the Wisp is easy to use and easy to clean. The replaceable cushion consists of the soft silicone seal which is attached directly and permanently to the hard, polycarbonate plastic shell which fits into the clear silicone or fabric "frame". The cushion, frame, headgear (with quick-release clips) and short tube are the only components of this mask. The short tube is approximately 15 inches long and connects to any standard CPAP tube. One end of the short tube is the mask elbow with air vent and quick-release mechanism. The mask elbow rotates a full 360-degrees when connected to the mask. The other end of the short tube is a clear plastic swivel that also rotates 360-degrees. This swiveling action will reduce tugging and twisting of the CPAP tube, and will make wearing the mask more comfortable. The stretchy headgear strap has four anchor points and is fully adjustable with hook-and-loop closures at each anchor point. The headgear strap seems to run a little small, so if you have a big head (like a hat size bigger than 8) you may notice that the headgear strap is slightly tight the first couple of nights of use. It will stretch out a bit after the first couple of uses, especially if you purposely don't use the quick-release headgear clips and choose, instead, to pull the mask off by stretching the headgear. The entire mask weighs about 3 ounces. Part numbers: Clear Frame (1094050), Fabric Frame (1094051). During Philips Respironics' preference study, patients said they had a better quality of sleep and experienced a greater level of comfort and seal compared to other leading nasal and pillows masks. Wisp comes in a clear unobtrusive silicone frame, or a soft and pliable fabric frame – the choice is yours! Available in three sizes that comfortably fits over 98% of patients – Wisp combines comfort, ease of use and style for a better nights sleep. An open field of vision for greater independence – you can read, watch TV and even wear glasses before you go to sleep. A minimal part count and click fit headgear clips make Wisp easy to use and maintain – letting you spend more time doing the things you enjoy. Average Customer Review: 4.5 of 5 Total Reviews: 91 Write a review.